As much as we love shopping for luxurious decor for our interiors, most of us simply can't afford the high-end products we adore. But one supermarket favourite has made our lives - and our homes - a lot more interesting with a new homeware range. Morrisons recently announced the launch of their new collection - and we're ready to load up our baskets with treats. The Spring Summer 2018 Cook & Home collection hits the stores on 19 March. With a huge 1,500 products on offer, the range includes home furnishings, cookware, tableware, bedding and electricals, as well as smaller touches like candles and towels. The best bit? Prices start at just £2. Deep blue patterned bedsheets and pops of teal add a contemporary feel to a neutral apartment scheme. 100% cotton indigo ink double duvet set, £18; teal knit throw, £27; teal knit cushion, £10; white housewife pillow cases, £6 for a pack of two; teal velvet cushion, £8; ombre glass bottle vase, £12; ombre waxfill, £2; pillar candle, £2; wooden handle white lantern, £13, all Morrisons. Add a touch of spring to your living room with these pretty pieces. Butterfly pink cushion, £8; duck egg mohair cushion, £8; duck egg herringbone throw, £18; butterfly ceramic jug, £12; butterfly filled frame, £8; butterfly glass frame, £8; butterfly storage box, £8; floral lamp shade, £7; spring bouquet pot pourri, £3, all Morrisons. If a trip to the spa is on your list of things to do, why not transform your own bathroom into a relaxing haven of your own? Egyptian cotton towels, from £4; white reversible cotton bath mat, £5; indigo geo brass soap dispenser, £5; indigo geo soap dish, £3.50; brass geo tealight holder, £3.50; glass hurricane vase, £10; My Spa soaps, £1 each, all Morrisons. Bring the outdoors in with beautiful floral patterns in your bedroom. £100% cotton grey floral double duvet set, £18; silver sequin knit throw, £20; blush fine knit throw, £20; large grey velvet cushion, £12; 100% cotton grey housewife pillow cases, £6; blush velvet cushion, £6, Morrisons. 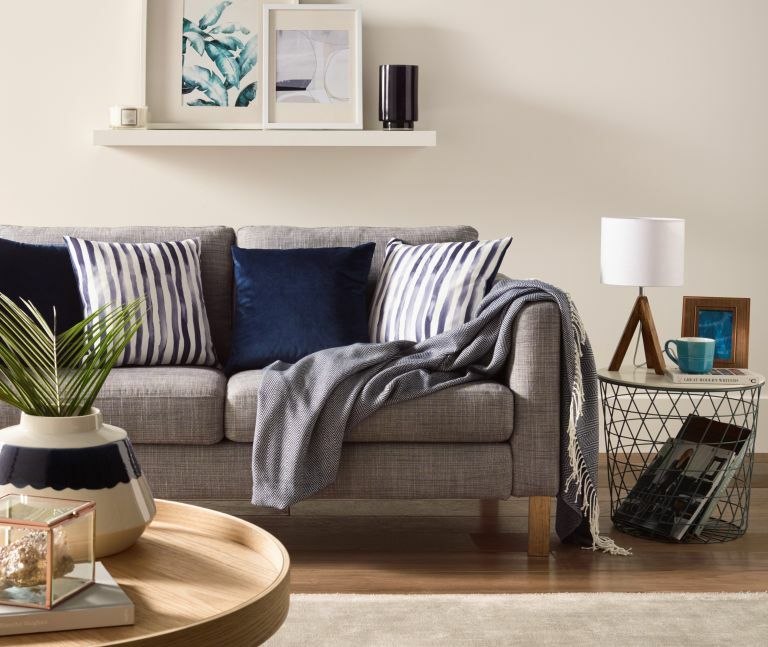 Liven up your living room with an inviting mix of textures, colours and patterns. Indigo watercolour stripe cushion, £8; indigo velvet cushion, £8; indigo herringbone throw, £18; wood tripod lamp, £15; indigo watercolour vase, £15, all Morrisons. Home offices don't need to be stuffy. Create a space of your own with warm textures like wood and brass for a space that almost makes it a pleasure to work (we did say almost). Brass and wood clock, £10; brass and wood draws, £12; succulent plants, £5 each; brass letter rack, £10; brass picture frame, £6; ceramic Follow the Sun plaque, £4, all Morrisons.